Many home improvement projects require the use of power tools, including chain saws. Chainsaws can be useful as a cutting tool in any project. Compared with a handsaw or axe, chainsaws could complete a task within minutes. Chainsaws could help us to achieve a degree of efficiency that can’t be achieved with standard manually-operated tools. As an example, we could immediately slice and dice a trunk in just minutes. However, it also means that we would be able to decapitate limbs in a split second. This could happen due to pure carelessness and a momentary lapse in judgment. Despite the possible risks of using a chainsaw, we shouldn’t be afraid in using it. In fact, many people are motivated in using chainsaw, because it often seen as a symbol of power and manhood. Even so, we should still prioritize safety and there are safe techniques that we could use. The detailed proper usages of chainsaw is beyond the scope of this simple article, but we should try to use common sense when using it. We should try to use multiple chainsaw safety equipments. No matter how well we have maintained the saw, we should know that slippages and accidents can happen if we are careless. Using chainsaw is similar to driving a car. We should make sure that we are alert enough and we have the necessary skills to use the chainsaw. Even if we are driving the most well maintained cars, there’s still a risk of accidents. Even so, we should be prepared for any kind of possibility. If cars can be equipped with airbag or anti lock braking system, we could also add multiple safety features to our chainsaw. It also means that we should be prepared for any kind of worst case scenario when using the chainsaw. 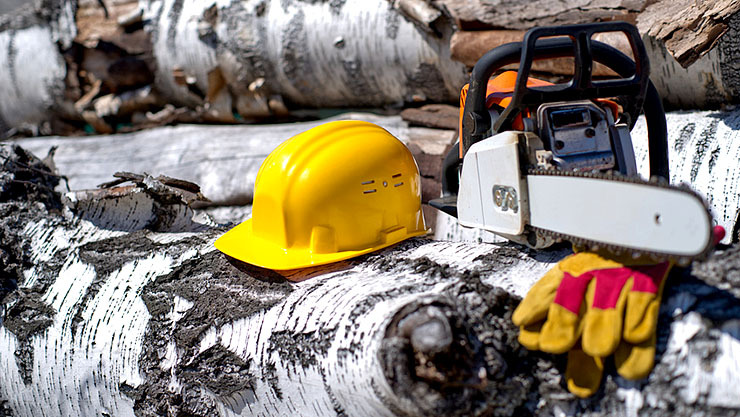 Safety measures for chainsaw usages may include steel-toed boots, thick gloves and helmets with face shield. Chainsaw chaps can be considered as among the most important safety features for chainsaw, Chaps could protect ourselves from many kinds of chainsaw-related accidents, including cuts to the lower parts of our body. Chainsaw chaps could stop chainsaw that turns at 2750 feet per minute without penetrating into the inner layer of the chap. On the other hand, at the same speed, chainsaw would cut through our blue jeans easier than a hot knife through a block of butter. Another safety consideration is to keep our saw sharp and a dull chainsaw is a dangerous chainsaw. A dull chainsaw could still cause serious injuries and kickback is likely to happen when the chainsaw is dull. We could sharpen chainsaw with standard band files and we should read the instruction about the proper techniques. If we are not sure, we should take the chainsaw to a professional who knows how to sharpen it. We should also make sure that the chainsaw is fully suited for the task, As an example, we don’t need a powerful chainsaw to prune twigs or cut down saplings. After we are sure that the chainsaw is proper for the job at hand, then we could immediately use it.